In Yakima, Washington, anxious migrant farmers worry about deportation. This story was originally published by Crosscut. The crowd at an April Yakima City Council meeting overflows the chambers into the main hall, where a couple dozen residents wait as the council ticks off each item on the agenda: a “stand against racism day” proclamation, zoning changes, political sign placement and fundraising updates for the Yakima Central Plaza. The usual order of business is rearranged to postpone comments from the crowd about the city’s role in protecting Latino residents who are scared to interact with police for fear they could end up in an immigration detention center. Finally, about three hours into the meeting, Maria Cruz Cuevas stands behind a podium almost as tall as she is, with the microphone pulled down to amplify her quick, flowing Spanish, talking through a translator to the panel of mostly white faces that make up the city government. The 63-year-old Cuevas came to Washington in 1974 from Colima, Mexico, to work in fields and fruit-packing warehouses. She says she speaks for those workers for whom the months since Donald Trump was elected president have passed in panic as racism has become more pronounced and threats from federal immigration authorities have struck fear in homes and schools and on farms throughout the state. 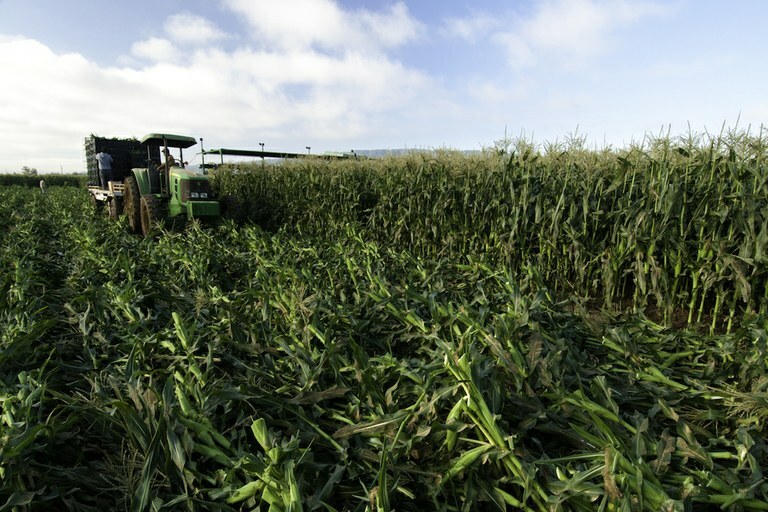 Corn is harvested on Uesugi Farms in Gilroy, California. Like Andreo, a dairy farmworker in Sunnyside who came to the country illegally about 16 years ago. He doesn’t feel safe or valued, despite his employer’s open anxiety about losing his skilled workforce because of the new administration. And Lizbeth, a fieldworker in Prosser who came to the U.S. on a tourist visa with her mother and brothers and then stayed. In the hours between dropping her kids — all American citizens by birth — at daycare at 4 a.m. and getting them at 5:30 p.m., she worries about rumors that Immigration and Customs Enforcement agents will raid farms. In Yakima, advocates from OneAmerica and other Washington organizations are leading a campaign to clarify the city’s policing policies, which is why Cuevas and a handful of other people out of a group of nearly 30 at the meeting stand up in front of the council, urging its members to consider the immigrant every time they hold a piece of fruit. Whether in vineyards, orchards or potato fields, Washington’s largest industry runs on immigrant labor. The average number of jobs for seasonal and nonseasonal agriculture workers grew from 74,486 in 2005 to 96,167 in 2015, according to the Washington State Employment Security Department. And it isn’t just fieldwork. Their children fill classrooms and their sisters, mothers and daughters give birth in hospitals – institutions that bring jobs and money to small towns. At the Northwest Immigrant Rights Project office in Granger, immigration advocates are swamped with calls and appointments to help individuals and families determine if they’re eligible for citizenship, and what to do with the answer. The organization also offers advocacy, education and legal services in Seattle, Tacoma and Wenatchee. In Granger, which covers the southern half of counties in central and eastern Washington, advocates started to see an uptick in demand last year, so they added a monthly walk-in day that drew 30 to 60 people, says Director Laura Contreras. “Since the new administration, our numbers just quadrupled,” she says. On a regular walk-in day this winter, the line could have stretched down a city block. The Trump administration’s threats to crack down on jurisdictions that it says violate federal law by not cooperating with immigration authorities hover over local governments in Washington, and many are unwilling to upset those powers. A recent list published by the Center for Immigration Studies included several eastern Washington counties, leading some to redouble their efforts to show they’re trying to cooperate without crossing legal lines. She says some offensive public comments compared immigrants who entered the U.S. illegally to pedophiles. After the resolution failed in January, two other council members, Dulce Gutierrez and Carmen Mendez, proposed adding an “inclusive policing policy” to an existing ordinance that, among other provisions, assured residents that when they report a crime, police would not ask for their immigration status or hold anyone for ICE without a court order. Advocates frequently say this fear of police keeps people from reporting domestic violence. Debate followed, with more people saying the ordinance isn’t necessary. Immigration advocates disagreed. David Morales, an attorney in Yakima and commissioner with the Washington State Commission on Hispanic Affairs, says that in practice, Yakima authorities cooperate with ICE a great deal. Given the uncertainty of how Trump’s nativist ideology will play out at the federal level, he thinks the city needs to have a long, honest conversation about how to limit that cooperation to protect people’s rights. The council approved a months-long window to draft the policy, and several skeptical members said they would hold public meetings to become more familiar with the issues the proposal raised, Avila Gutierrez says. But before the time was up, on April 4, with no notice on the agenda and while Mendez was absent, a councilmember asked for a vote to cease all discussion on the proposed ordinance, calling it “a waste of time,” Gutierrez says. The motion carried, four votes to two. Advocates fumed and accused the council of dismissing constituents’ concerns in a sneaky and opaque way. Gutierrez says her colleagues betrayed their constituents and were swayed by hateful comments based on stereotypes and prejudice. But immigrants are in the worst position to influence public policy, she says. Mayor Kathy Coffey, who voted against both proposals, did not return a request for comment. Two weeks after the council tabled the resolution, advocates and residents, including Cuevas, lined up to tell the council that the choice to overlook their concerns was wrong and would breed more fear in the community. One pointed to the irony of proclaiming April 28 “Stand Against Racism Day” in Yakima, and wondered aloud if the council would continue to ignore such a large section of its constituency. The fight isn’t over, advocates say. It took years and a voting rights lawsuit for Yakima to redraw districts that directly led to the election of three Latina councilmembers in 2015. Since then, more Latino residents show up at meetings, demanding better services in their neighborhoods and access to officials, including Spanish translation of official documents and public meetings. Here and there, the city has made small changes that treat the symptoms but not the underlying problem, she says. Now a new president raises new challenges to representing all the various opinions and experiences of local people.